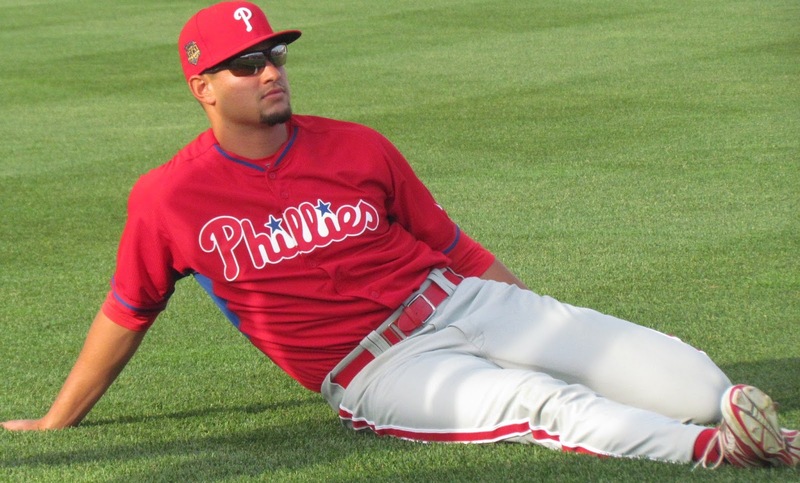 Cozens, the Phillies 16th ranked prospect, joined Reading late last season and proved to be a worthy contributor, helping the team reach the Eastern League finals. The powerful lefty batting 21-year-old posted a .350 average with three homers and nine RBI in 11 games after his promotion from High A Clearwater. Overall with the Threshers, prior to moving up, Cozens, the Phils’ 2nd round draft selection in 2012, posted a .282 average with five home runs and 46 RBI in 96 games. Quinn, missed time last season following a quad injury, but posted excellent numbers (.306 avg, four HR, 15 RBI, 29 SB in 58 games) prior to being sidelined. 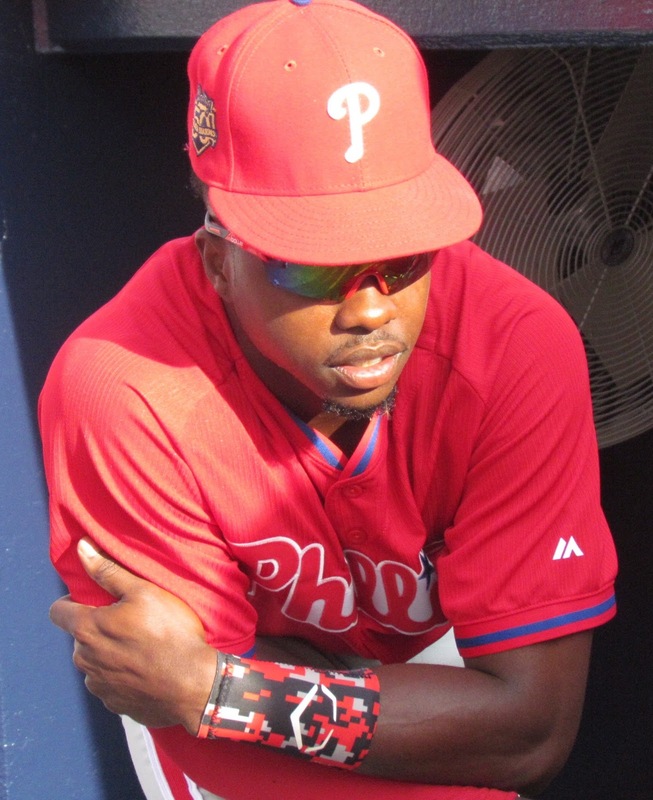 The 22-year-old was the Phillies’ 2nd round draft choice in 2011. Quinn is the 6th ranked Phils prospect heading into the season. Reading ahead for full quotes from two-thirds of Reading’s outfield heading into the 2016 campaign. Spring training was good. Playing in Clearwater was a lot of fun, then I got to come up here (for the Futures games). It’s good to be back here for another season. I’m looking forward to having a good team and having a lot of fun this year. It’s always kind of nice to get your feet wet a little bit and come and check the place out a bit. So, it’s going to be nice for us to play in Philly, so that when we do get called up, if we get called up, we’ll have a feel for it. That’s kind of how it was for me in Reading, to know where stuff is, know how the field plays, stuff like that. Definitely, I feel confident heading into the season and we’re gonna do some damage then maybe head up to Philly pretty soon. I’d say Maikel Franco is a big guy to look at, look up to kind of. I’ve seen him play throughout the minor leagues. I’ve played with him a couple times. Um, same with Aaron Nola. Just they’ve both got good heads on their shoulders, hard work ethic, stuff like that, I just try to do what they do pretty much. Oh yeah, definitely. Maybe try to get 30 (steals) this year instead of 20 in previous years. We’ll see. Maybe 40, I don’t know. We’ll see if it paid off. I feel like flexibility was a big thing for me, where last year I kind of started out the year real tight…and I wasn’t really hitting balls true. And I feel like now that I’m loose, I can kind of spin the balls better and I don’t feel like it’s effecting my power at all. If anything, I feel like I’ve got more power. It’s great. It’s nice for us to hang around the big league guys, see how they go about their business, get a chance to compete against them, kind of see where we’re at. Hopefully, we can beat them. That would give us a lot of confidence going into the year, but it’s awesome. Getting to play in Citizens Bank Park is huge too, because to see how the ball comes in there and how the field plays before we get called up is a huge advantage. I thought the umpires were better (in Double-A). I thought the strike zone was a little better and maybe the ball parks definitely were better than before, as in they’re nicer, more hitter friendly. I can up at the right time of the year I guess. It was fun. I felt like I was having fun out there. I wasn’t pressing, everything was going good. It’s always good, you know, when you’re winning too. That also, that helps. Most winning teams have good chemistry. They are very few winning teams out there that don’t get along or they’re fighting. I feel that is a big part of being a winning team too. I mean I’ve been feeling healthy since the last time I tore my quad. Feeling good. Ready to get back on the field. I’m 100-percent. I’m ready. No, I couldn’t have. I couldn’t have played. I wasn’t quite ready yet. I wasn’t up to 100-percent. I was increasing my speed daily, but I wasn’t quite 100-percent yet. It definitely was, man. It definitely was. Especially because I’m a competitor. I wanted to go out there and compete with them. But they did great without me. I mean, it’s going to be a great experience. I think we’re all going to go out there and have fun. Especially coming and playing in Reading. I mean some of these guys have played in Reading, so it’s pretty cool. That’s going to be fun. That’s a great ball park. It’s pretty big too and I’m excited to see the fans there. No, I’m not worried at all. Some of the injuries I had was freaky. Freak injuries and we played an 18-inning game and we was playing a lot of extra-inning games last year before I got hurt and I’m not concerned at all. I wasn’t surprised at all. I was looking at starting in Double-A anyway. (Scott) Kingery. I heard he was a real good player, man. A really good second baseman. So, I’m excited to see him play.